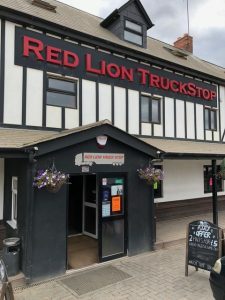 The Red Lion truckstop at Northampton was established over 30 years and is just 200 yards from junction 16 of the M1 making it very convenient place for truckers to park to get a meal. It’s a big establishment that offers plenty of facilities. The restaurant offers varied cuisines and there’s a bar, convenience store, laundry facility, clean toilets and showers. It certainly was popular – especially with foreign drivers – on the day TSN visited to check it out. The Red Lion is open Monday to Friday from 0500-2300, on Saturdays from 0630 to 2300 and on Sundays from 1000-2300. The mega belly buster at £6.95 has four bacon, three each of sausages, hash browns and eggs, plus mushrooms, black pudding, beans and tomatoes. Also available are beans, cheese, eggs (fried, scrambled or poached) on toast. You can also build your own breakfasts with all the various ‘components’ to suit your exact requirements. The Red Lion offers a house special of cheese, steak and onion baguette at £4.30. Then there is the range of other baguettes priced between £3.35 and £3.95 and includes ham salad, ham & eggs, bacon & cheese, tuna mayo, sausage & onions, bacon & sausage, corn beef, bacon, lettuce & tomato and cheese salad. Also available are sandwiches priced between £2.20 through to £3.95 and include bacon, sausage, ham salad, tuna, corn beef, sausage & egg, steak & onion, bacon & mushrooms, sausage & bacon, bacon & egg, cheese & onion and cheese salad. The panini range – from £3.50 to £4.20 – includes steak & onions, ham & cheese, tuna cheese melt, and cheese with either mushrooms, peppers or tomatoes. Jacket potatoes come as plain with butter at £2.99 or with one topping at £4.25 or two toppings at £4.95 – with a choice of cheese, beans, coleslaw, bacon, ham, chilli con carne and tuna mayo. Salads are chicken and bacon Caesar, green, sweet chilli chicken all at £6.75 while ham & pineapple or tuna and egg are both £5.95 a go. The Red Lion has an extensive menu of main meals with dishes for everybody’s palette. Tortilla chips with cheese, jalapenos, salsa and chilli is £5 – a vegetarian option is £4. From the grill, there is the sticky platter at £9.95, the Full Monty mixed grill at £11.95, minted lamb steaks at £9.45, 10oz Gammon steak at £7.95, rump steak at £9.95, ribeye steak at £10.45 and barbeque spare ribs at £9.95. You can upgrade any of these to ‘surf and turf’ for £3. There is a varied selection of other main meals. They include Hunter’s chicken at £6.45, Black pepper chicken nibblets at £6.25 and Jerk chicken at £7.45. 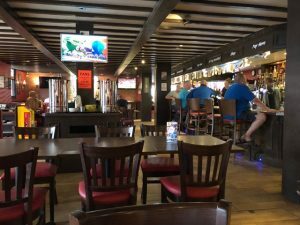 The popular dishes include cod and chips (£7.95), scampi (£6.95), spaghetti bolognaise (£6.95), lasagne (£7.25), penne arrabbiata (£6.35), shepherd’s pie (£7.25) and chicken, ham & leek, steak & ale or steak & kidney pies (all £6.45). Sausage, mash & Yorkshire pudding is £6.75. For those liking something a bit hotter, then there is chicken tikka masala and chicken jalfrezi (both £7.95), beef madras (£8.45), Tandoori chicken (£7.75) and lamb kofta (£6.25). Chilli con carne is £6.95. There is a wide range of burger options to suit all tastes. A standard 6oz beef burger is £5.95 while a cheeseburger or chicken burger are both £6.25. A cheese and bacon burger is £6.40 while a sticky barbeque beef burger with cheese is just five pence more. The ‘Big daddy’ or ‘Express lift tower’ burgers are both £7.95 while the ‘Mamma Mia’ burger is priced at £6.95. there are also veggie or spicy bean burgers both at £5.95. All burgers come with chips and coleslaw and you can upgrade to sweet potato fries for an extra quid. The Red Lion has showers for both sexes. There is also an outdoor washroom and toilet for those leaving early, which are also open 24 hours. Each shower is in its own cubical, with its own separate dry area and sink area to provide privacy. After each use, a manned attendant will clean it and bring it back to standard for the next use. Its overnight security includes infrared CCTV cameras that monitor the site 24 hours a day. 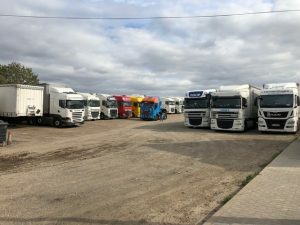 There is parking for over 150 HGVs with manned parking attendants. High mounting banks stop intruders entering the site. The Red Lion is also a member of the Park Mark Scheme, which helps it to constantly improve the security of the site. A new security building just been built, offering more lights around the premises. 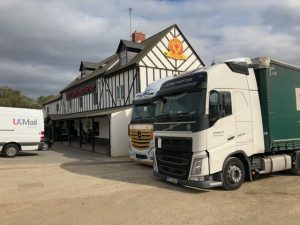 There is also a large, well-stocked, shop for drivers specialising in cooking equipment, CB radios and accessories, vehicle hardware and truck accessories, in-cab decoration and entertainment, cab care products and clothing. It also stocks every day essentials such as toiletries and medication. The site also has a bar and shows all live football games on big screen TVs. The bar sells draught beers, bottles, cans, ciders, spirits, wines and soft drinks. There are ‘beer nights’ twice a week as well as extended Footy Hour on football nights, giving drivers discounted pints during the game. In addition there are special one-off promotion nights. There is a free-to-use ATM and the Red Lion offers a laundry service, with coin-operated machines that have built-in detergent and softener. 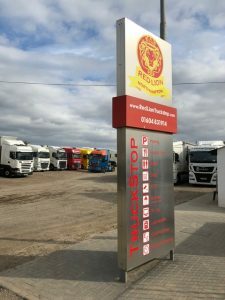 It’s clear this is a truckstop that is geared up to serve drivers. 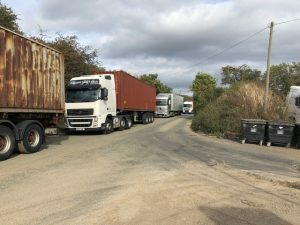 There is plenty of room for trucks, although several were parked in the approach road on the day of our visit. However, it was very busy, so you need to be on your best to park in some of the tight spots that were vacant! The food was delivered promptly. It wasn’t outstanding, but it certainly wasn’t poor, and the choice was excellent. The staff were helpful and polite, and the place was clean and pleasant to eat at.